Processes used: Green sand (squeezer and rollover), Air set molding. Casting Size: from 1 oz. to 900 lbs. We specialize in small, short to medium run castings, medium to large short run castings. We can provide Aluminum castings with Steel inserts or steel elements cast in. All aluminum is degassed with our Rotary Degassing unit prior to pouring to ensure the most sound, highest quality castings. 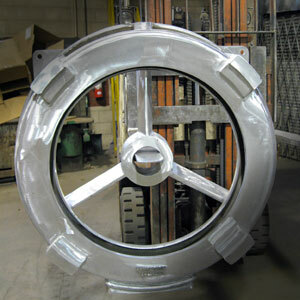 Brumund Foundry provides High quality Aluminum castings in Chicago. Machine parts, Housings, pump bodies, Ornamental & decorative castings, Brumund Foundry can provide it. Contact us for a quote!